After the main sequence, stars become what astronomers call red giants. This is the time when the star begins to die. As with anything in nature, stars need fuel. Well there is only so much hydrogen to fuel a star's fusion reactions. Eventually that fuel runs out. When the star begins to cool, it grows. The cooling takes the color of the star and drops it into the red range, leaving a red giant. A nearby star named Betelgeuse is a red giant. So the star is cooling and the fire is burning out. There comes a point where the star's reactions stop and an explosion occurs. One day, BOOM! 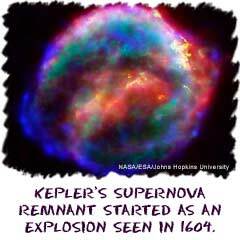 That boom is the supernova. After that explosion, the atmosphere is blown away from the star. In the same way there was a nebula of gas and dust before the star was born, a new nebula is created from the explosion. Astronomers call the nebula after the explosion a planetary nebula. Without an atmosphere and all of the flames, stars really aren't that much. A little ball of heavy elements is left where the enormous star once was. This is the final phase of the star's life. It has become a white dwarf. The core of the star is left, some fires still burn, but there is very little fuel left. Astronomers can see the dwarf after the nebula has dissipated. Sadly, the white dwarf eventually goes out. The life of a star is not always finished with the white dwarf. Sometimes the star continues to contract and its gravity increases. Imagine that the Earth contracted. First to half its size and then a quarter. Then even smaller. Imagine that the entire mass of the Earth was able to fit in your house. The gravity would be enormous. That's what happens with some stars. They continue to contract and their gravity increases. They become black holes. Black holes have gravity so strong that even light cannot escape the star.